Could you explain how AP power works in RUSE? Is AP scaling by range present in RUSE? Do tanks have weaker side and rear armour? The AP damage is Ruse does not depend of the distance or side. Which mean that putting your mediums behind a town is very effective to ambush heavy tanks. 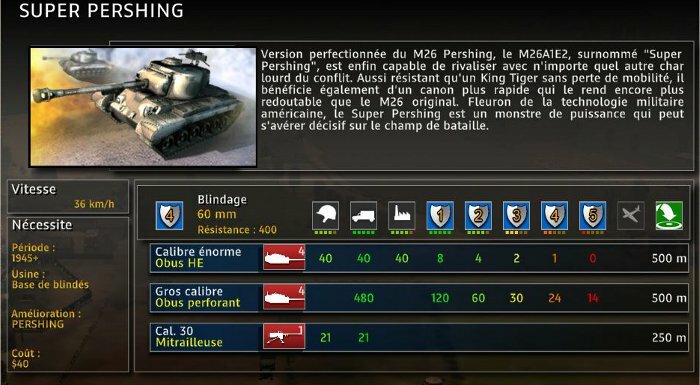 As you can see, every unit has 400hp, and the Super Pershing will deal 120 damage to an armor 1 unit at each shoot whatever the range. Solvens' chart shows that some of the units have lesser dispersion at max range than at min range. Is it intentional? Last edited by Gyg on Sat 23 Feb 2013 17:05, edited 1 time in total. Solvens' chart shows that some of the units have lesser dispersion at max range than at mean range. Is it intentional? Nope, it just shows minimal range itself. solvens wrote: The AP damage is Ruse does not depend of the distance or side. Heavy/Elite Infantry have 500hp in RUSE. Last edited by Covert-141 on Sun 24 Feb 2013 16:50, edited 3 times in total. Isn't there a forum for RUSE ? After new patch don't forget to add BM-21 and RM-70 in artillery section. Thank you a lot for this thread!